You decide to buy a new sofa? This is a very serious step and make it worth considering. If the choice of kitchen furniture or wardrobes guided usually aesthetic characteristics, then buying a sofa, you need to pay attention primarily on its size, the folding mechanism, safety and comfort for a nights sleep. Comfort One of the main qualities you should have a good mattress sofa - is orthopedic body support, provide for a peaceful and deep sleep the whole night. For this purpose, it is best to buy a sofa with spring blocks, as they are more durable in use, and their sleeper eventually deformed. When buying such a couch, check spring to the touch, so do not hesitate - squat on favorite sofa - it should be fairly firm and elastic, and shall make no extraneous sounds. Very often in the sale can be seen pretty sofas padded at rather low and attractive prices. The mechanism of folding sofa is one of the most important selection parameters sofa: it will depend on not only the lifetime but also accommodation option to the apartment. 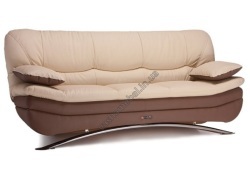 There are the following mechanisms folding sofas: euro-book, a sofa bed, an accordion and a pullout sofa. Euro-book is one of the most popular methods of modern folding sofa, in which due to lift seats, folding couch falls horizontally. Upholstered furniture of this type is strong enough to demand from potential buyers. 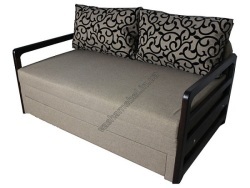 Sofa beds for typical disclosure bed that is located under the seat. When buying a sleeper sofa, special attention should be paid to the material from which made the mechanism (preference should be given to the spring mechanism) and a niche for laundry (the best option - plywood), and also pay attention to the metal grid and the support of the belts. 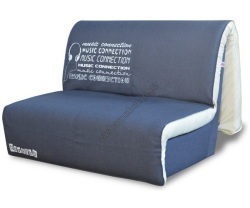 Sofa with accordion system is easy to use and operate, however, it should be noted that it is a negative feature of soft and thin mattress that deteriorating rapidly. Sofa upholstery Due to the fact that the sofa will use almost all the family members, think about choice of fabric for upholstery and its operational capacities. Flock: although it looks presentable enough, however, is reliable, is not afraid of stains and lends itself to any cleaning. In another case with Shinile and jacquard: These fabrics are beautiful, however, afraid of active operation and quickly lose form. Upholstery or jacquard subject shinila dry clean only. 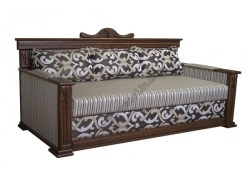 One of the characteristics of durability of upholstered furniture is the material from which the frame is made. Manufacturer with a good reputation for producing quality furniture will only use well-dried wood or plywood. Application chipboard undesirable as this furniture will last long. Do not forget about such an important moment, as a combination of the sofa with the interior of your room. To this end, almost all manufacturers and vendors offer a service for the manufacture of upholstered furniture to order, where you can specify the dimensions of the sofa, his style, type of mechanism, upholstery material and its coloring and appearance of the product (normal sofa, sofa, corner sofa) . Remember seller - your friend! It not only tells you about the pros and cons liked the sofa, but also offer carefully consider it, will determine the design and give valuable tips on care.